External Service Users. Provide methods for Procurement Requests or Supplier Registration. Web Portals provide a variety of functions that add sophisticated content management, knowledge, case management, opportunity management, membership, profile and self-service capabilities. Sysco Healthcare provides “out of the box” solutions that are also customisation or portals can be created to your exact specifications. Portals can be used to setup an interactive, web based sales, customer service, support and social engagement platform that engages with your user communities and partners. For example, provide a simple way for suppliers to register their products and services with your procurement team or provide a method for employees to login and download their pay slips. 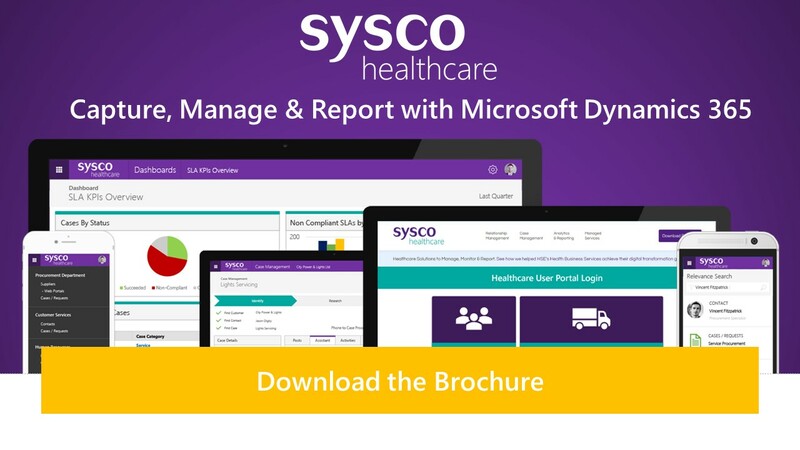 With Sysco Healthcare you can quickly build and prototype secure, self-service customer experiences optimised for mobile and desktop clients. Sysco Healthcare are experienced in providing exceptional user experiences that will assist your teams in increasing service user and citizen engagement and their satisfaction of the services you provide. Sysco Healthcare Web Portals can be made as standalone applications or integrated with existing websites and services including branding and visual styles.